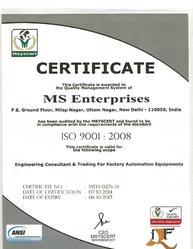 Broadly recognized for consulting and supplying a wide spectrum of Automation Equipments, we "MS Enterprises (Sister Concern of MSE India Projects)" ISO 9001:2008 certified firm, started our operation in the year of 2014. Under this quality assured array of products we are offering Fluid Control System, Pneumatic Products and Measuring Instruments. Our provided array of products are highly appreciated and demanded by the customers for their superior quality, best performance and longer service life. These products are manufactured and designed by the qualified professionals of our vendors. Our vendors consider only optimum grade basic material to manufacture the offered array of products. We are offering these products in various specifications. We are fully supported by our highly efficient and trusted vendors. These vendors are providing best quality products as per the preference of our client. We have shortlisted these vendors on behalf of their product quality and legal status. Some of the reputed names from our vendor base are ROTEX, AVCON, IMI NORGREN, FLUID TECQ and SMC PNEUMATICS. Better Service and Better Response is Mul Mantra of our organization and we are working with this approach. We are backed by a team of highly qualified and talented professionals. With the help of these professionals we are able to provide optimum quality array of products. Under the direction of our mentor "Mr. Chinmaya Mohanty", we are able to set this benchmark in the industry in short period of time. His managerial skills and ability to handle the critical condition enable us to win the faith and confidence of our clients. Owing to our team of qualified and talented professionals, we have been able to fulfill the ever-changing demands and needs of our esteemed customers in the most proficient manner. Our team members hold immense expertise in their respective field. Our team members work in full cooperation with each other and also with our valued clients, in order to ensure a dispute and trouble-free working environment and customer satisfaction. In order to enhance their skills in the most systematic way, we provide those training sessions and seminars at regular period of time. We are associated with a huge number of trustworthy and certified vendors of the relevant industry. We have selected these vendors after verifying their legal status, product quality and production capacity. These vendors are fully aware about our client focused approach so they are providing the product as per our client’s choice and preferences. We are able to suit the bulk orders of the offered products owing to our vendor’s capacity. During the manufacturing, our vendors conduct multiple quality checks to make sure that only defect free product is delivered to the customers. Some of the reputed names from our vendor base are ROTEX, AVCON, IMI NORGREN, FLUID TECQ and SMC PNEUMATICS. Our organization always captures each and every possible step to offer optimum quality of our product array for our customers. For giving our valuable patrons a finest quality product range, the offered products are manufactured and designed using highest grade factory material and top notch technology by our reliable vendors to ensure their exceptional finish and higher durability. Our vendor’s team of quality controllers checked the entire selection against various quality parameters to deliver defect free product to our prestigious clients. Our organization is well known name among the customers for the premium quality Automation Equipments. We are offering these products in diverse specifications as per the set industry norms and standards. To suit the client’s demands and needs in best possible manner, we are offering our product array at nominal market price. “We are targeting to customers paying our better service with great level of satisfaction for a long run period”. Timely executing the project work as per committed time. Proper Execution enquiry and Order. Fully Technical support from time to time. Better Price with Better Quality. We recommend the Quality in order to reliability.